With the holidays just around the corner, we wanted to take this opportunity to wish our readers all the best that the season has to offer. We’d also like to remind our customers that we’ll be shredding right through to the New Year, providing the GTA with secure document and electronic data destruction. We’re ready to tackle any residential or commercial purge this December, or we can coordinate a regular pick up in 2017. Whatever it is you need done, we can arrange it — even if it’s a last minute gift for a security concerned friend. Let’s be honest — it can be tough finding a gift for the person who has everything, especially when that everything starts to pile up in the corners. If you’re struggling to come up with a unique and practical present this holiday, consider the gift of a clutter-free home or a clean office with our on-site shredding services. We can accommodate any residential or commercial needs with one-time purges and recurring visits available depending on the amount of paper or electronics that need to be destroyed. Whether it’s a regular engagement or a singular appointment, our fully insured and bonded representatives will arrive with our NAID-certified mobile shredders — eliminating any need for your loved one to drive their documents to a far-off facility. We’ve created a process that requires as little effort on behalf of our customers as possible. It also completely destroys any paper or electronic material, so the information they once stored can no longer be retrieved. Our “Guarantee of Destruction” is delivered once our mobile shredders have gone through everything, so you can feel secure about your personal information. The benefits that come from scheduling a visit from our mobile shredders are two-fold. For one thing, we can help eliminate clutter. Wall to wall clutter exacerbated by papers and electronic junk contribute to stress and distractibility. The more there is, the more stress we feel. Our crew can help you achieve a clean and tidy office or living room just in time for the holidays, so you can achieve some inner-peace during the season. Secondly, our destruction services come with an additional “Guarantee of Recycling” so you can also give the gift of an environmentally friendly service. To date we’ve managed to save over 11,000 trees, 4.5 million gallons of water, and 1,600 cubic yards of landfill space. Give a gift you feel good about and wrap up a certificate for our services. Whether it’s a gift for a loved one, yourself, or your business, you can always depend on the team at Absolute Destruction to deliver on secure, eco-friendly shredding. So give us a call before the big day, and schedule a visit with one of our trucks. 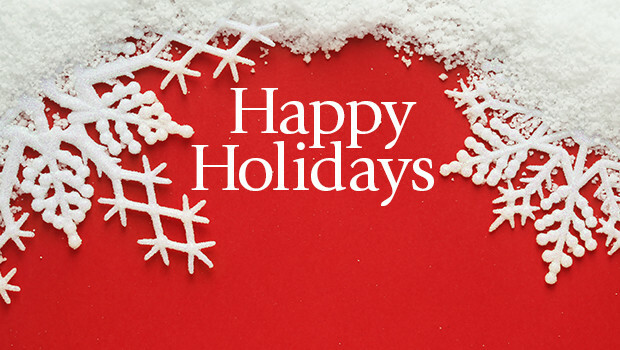 Until then, we’d like to say happy holidays from our crew and the best of luck in the New Year.